Last week, the Metro Manila Development Authority headed by Francis Tolentino has announced the entries for this year’s Metro Manila Film Festival. And as expected, MMFF staples such as Vice Ganda, Robin Padilla, Vic Sotto, Kris Aquino, and Aiai delas Alas all have entries this year. Once the festival home of films such as Himala, Burlesk Queen, Karnal, Itanong Mo Sa Buwan, Magic Temple, and Dekada ’70, there has been a paradigm shift in terms of the criteria on how films are chosen the past decade. Commercial appeal has been the primary agenda now and box office as a main factor on which entries will make it. And while this has elicited a lot of criticisms, particularly the idea of prioritizing box office over “quality” films, the MMFF has still treated us with some notable films quality films over the years. This coming year, entries from Gil Portes, Antoinette Jadaone, Jose Javier Reyes, and Dan Villegas have been chosen while those of Erik Matti’s and Jeffrey Jeturian were in the waitlist categories. “Ulam” from Shake, Rattle, and Roll XV (director: Jerrold Tarog, 2014) – Ulam made good use of every minute we’ve seen on screen to show the horrors and tension of a marital relationship. “Katas ng Saudi” (director: Jose Javier Reyes, 2007) – Probably the most memorable OFW movies in local cinema depict those of a mother leaving their children behind. Here’s from a father’s perspective of coming home and realizing it isn’t what he expected. “Pagpag” (director: Frasco Mortiz, 2013) – It’s horror by the numbers, but it tackles such a Filipino ritual one can’t help but to give in to its scares. “Manila Kingpin: The Asiong Salonga Story” (director: Daryl dela Cruz, 2011) – It got its reputation as the one that started the action comeback, but its behind the scenes director mishap got in the way for the film to move from being good to being great. “One More Try” (director: Ruel Bayani, 2012) – Rip-off or not, the film brags of solid performances from its four leads, particularly that of its lead actress Angel Locsin. 10. 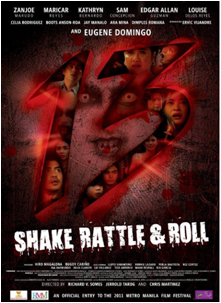 “Parola” from Shake, Rattle, and Roll 13 (director: Jerrold Tarog, 2011) – Parola is the perfect throwback to the early heydays of the Shake, Rattle, and Roll franchise, only with better production and technical achievements. Its scares mixes that of the old and the new, giving the type of scares that the audience will definitely bite. 09. “English Only Please” (director: Dan Villegas, 2014) – It’s easy to dismiss English Only Please from the get go, it’s not from the manufactured Star Cinema factory of kilig, not does it star a tandem that has a solid following. But it has proven that it doesn’t need any of those. It gives the same kilig and “feels” without the need to fall trap to the usual rom-com clichés. 08. 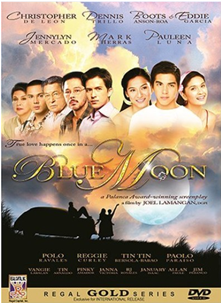 “Blue Moon” (director: Joel Lamangan, 2005) – During the last few years when Regal Films was still obsessed with this big star-studded ensembles in family dramas comes Lamangan directing a Palanca-winning screenplay about three generation of family members with the patriarch searching for his one true love. The film is mostly fluff hiding in between the big war backdrop, but its attempt is earnest one can’t help but fall in love with it. 07. 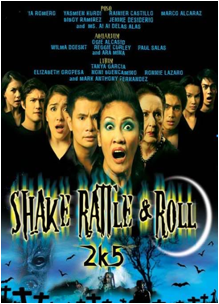 “Lihim ng San Joaquin” (director: Richard Somes, 2005) – When Shake, Rattle, and Roll made a comeback in the mid-Aughts, a lot expected to feel the throwback of the early 90s horror franchise. Instead, we got that ridiculous “Poso” episode and an uneven “Aquarium” one. Then comes “Lihim ng San Joaquin”, about a young , newlywed couple transferring to a rural town. This one will keep you on the edge of your seat with its silence. 06. 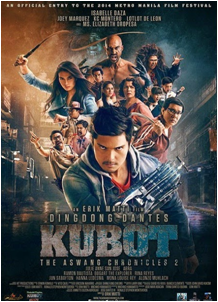 “Kubot: The Aswang Chronicles” (director: Erik Matti, 2014) – Sure, the MMFF has been a commercial venue for the whole family to enjoy, but with Kubot, the follow up to 2012’s Tiktik, Erik Matti proved that a sequel isn’t an alibi to come up with a lackluster addition to a franchise (which most MMFF franchises are guilty of doing). While it doesn’t necessarily have to beat its predecessor, it doesn’t have to be a downgrade as well. 05. 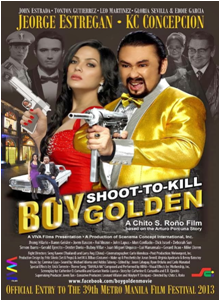 “Boy Golden: Shoot to Kill” (director: Chito Rono, 2013) – The best thing about Boy Golden is that it doesn’t want to prove anything. It doesn’t take itself seriously and just wants to have fun. And boy was it a fun movie-watching experience mixing camp and action we haven’t seen in a long time. 04. 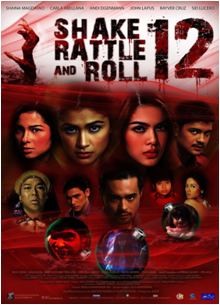 “Punerarya” from Shake, Rattle and Roll 12 (director: Jerrold Tarog, 2010) – Hands down, this is one of the best episodes ever in the whole SRR franchise. Jerrold Tarog’s first output stars Carla Abellana as a private tutor to two kids from the neighbor’s funeral parlor. And as secrets were slowly revealed, the tension just escalates further. This one doesn’t get old and is a must watch. 03. 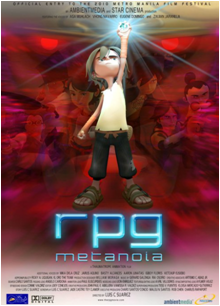 “RPG Metanoia” (director: Luis Suarez, 2010) – Not for lack of trying, the MMFF has welcomed local animation in the festival. Twice, even (the first one was 2008’s “Dayo sa Mundo ng Elemento”). RPG can brag about being the first Pinoy 3D animated film, but more than that achievement, its dedication in tackling a theme highlighting the rich Philippine culture is admirable. 02. “Kasal, Kasali, Kasalo” (director: Jose Javier Reyes, 2006) – On the outside, Kasal’s biggest achievement is how it managed to be a crowd-pleasing film, yet one that critics will positively respond as well. Digging deeper, it’s really not difficult to fall in love with this film. It touches the topic of a traditional Pinoy family whose value for marriage and relationship is as valuable to the whole family, maybe even more so, than to the actual couple. Obviously, the great ensemble elevated the already strong material further. 01. 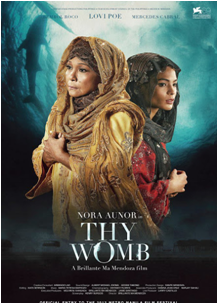 “Thy Womb” (director: Brillante Mendoza, 2012) – It’s silly when you think about it, that the best film of the festival of the last decade, was just a replacement choice of that year. Shot in the farthest village of Tawi-Tawi, “Thy Womb” wasn’t just the story of a midwife attempt to provide her husband a child, but it also opened us to a culture we aren’t particularly familiar with. I believe this is one of the films that will go down as the best in the history of the festival. Plus, it gave us Nora Aunor’s comeback performance. So as much as we rant and complain about the MMFF every year, chances are there are one or two entries that will really be worth of our money. This year has the potential to deliver as well. Si Agimat at si Enteng Kabisote is probably one of the most overstaying franchise in Metro Manila Film festival history. Enteng Kabisote is now on its seventh outing, while Agimat is now on its third. Its stars Bong Revilla and Vic Sotto has been festival mainstays for a long time now. This is Vic’s eleventh consecutive entry and Bong’s eighth since 1999. The two already previously collaborated on the first Agimat and Enteng two years ago. I really don’t know why I’m giving you all these details, but just so you know, they’re collaborating again this year with an additional companion via Judy Ann Santos in Tony Reyes’s Si Agimat si Enteng, at si AKO. When they’re not busy fighting off monsters, Agimat (Revilla) finally married long time girlfriend Samara (Sam Pinto). This means that pal Enteng (Vic Sotto) together with his wife Faye (Gwen Zamora) and the rest of the Kabisote gang is also invited. The third person in the crowd is environmentalist Angelina Kalinisan Orteza a.k.a AKO. When technologically savaged monsters are off to conquer the world, it is up to this trio to save the world and call it a day. Most of the first part of the movie was focused on introducing the three characters. We get to see how it was for Agimat and for Enteng and their respective partners. It was also an introduction for AKO’s character. From there, everything else went down. Now we got a boatload of product placements. Mind you, they’re not just simple product insertion in the background, but actual dialogues containing their individual endorsements. That was probably the movie’s lowest moment. But everyone else was annoying. The storyline with wives getting jealous to Ako was disastrous and annoying. I was thisclose to championing Ako to flirt with both Enteng and Agimat, but then I remembered this is not a mistress movie. Possible sequel next year perhaps? If anything, there’s not much to look forward to actually. I enjoyed Judy Ann Santos stint as Ako, though it was somewhat obvious that this is just a one time commitment. The three leads have chemistry, and I enjoyed their group hug running joke. The movie tried to fit in everything that they can just to say it’s a family friendly movie by including shallow portrayals of taking care of the environment or an overacting Aiza Seguerra in a group prayer scene. Some technical achievements were also commendable such as the make up and shots of the gorgeous Ilocos Norte. But amidst all this, these questions still remain: Is this really necessary? Would something have changed if the movie was not made? What can it still offer to its readers? And lastly, when will it end? GMA Films’ solo horse in this year’s Metro Manila Film Festival is a female driven comedy that derives its title from the conyos and the sosyal upper class people and their problems in life. Starring the foursome of Rhian Ramos, Heart Evangelista, Bianca King, and Solenn Heusaff, Sosy Problems is directed by Andoy Ranay. In the movie, we were introduced to four friends: Lizzy (Rhian Ramos) is the self proclaimed leader of the group, a spoiled daughter that will pass as an heiress. Claudia (Heart Evangelista) and Margaux (Solenn Heusaff) are daughters of two rival beauty queens. Despite that, the two are best friends despite their clashing mothers. The last one to complete the group is Danielle (Bianca King) whose father is a former congressman that dealt with some issues while in position causing the demise of their power and money. In the beginning, we see a TV exec planning to do a feature on them ala Keeping Up with the Kardashians, but the main sosy problem is for them to save their hangout place which is a polo club now bought by Bernice (Mylene Dizon), a promdi social climber who married someone famous that caused her instant rich status. The writing of the movie is a combination of overused and confused. It is overused with its recycled plots and lazy writing. A young woman tempted to keep up with her friends despite being financially incapable? Done! A rich daughter with a mother who has the accent of other dialects for? Done! Thing is, being original is not the strongest suit of most movies nowadays, but the writing here is terribly lazy that they didn’t even bother. It was confused in the sense that the first part dealt with the concept of getting them for a reality show when the second part dealt with them fighting for the polo club. I admit, there were probably one to two scenes, mostly involving the four leads in it such as their tea party and their rally to save the polo club, but when they’re individually on screen, they were relegated to these uninteresting characters that were been there done that. It seemed to me that the four women are having fun though, and I enjoyed Solenn Heusaff and Heart Evangelista the most. Rhian Ramos and Bianca King were okay too, though I did not buy Agot Isidro and Cherie Gil even for a second, and Mylene Dizon was a bit fun though I somewhat imagine Kris Aquino’s Sisterakas character to cross over their film. And I’m sorry but who’s giving Tim Yap the right to act? I really don’t know why he keeps on getting hired. He’s not an effin actor and is probably worse than all the other characters combined. The way he felt as if he’s the fifth sosy lady here is so annoying. The film took what could have been an interesting concept with the sosyal and the conyo people with a more interesting take in it. Sadly, though, even the writers had no interest of going there. They went easy way out of with the generalizations and the over the top portrayals of such. With that, it’s really hard to find anything that I can recommend to you to watch this movie. After last year’s surprise hit Manila Kingpin: The Asiong Salonga Story, Jeorge “ER” Estregan comes back for another round at the Metro Manila Film Festival. For this year, he goes with the historical drama from the perspective of Cavite hero Emilio Aguinaldo. 2003 MMFF Best Director Mark Meilly (Crying Ladies) wrote and directed the film which also stars Christopher de Leon, Cesar Montano, Cristine Reyes, and Nora Aunor among others. The film basically follows the story of Emilio Aguinaldo way back to his early days as the town mayor of Cavite el Viejo until his final remaining days in bed. What transpired in between was a trip down history lessons. The details according to the director were based from My Memoirs written by Emilio Aguinaldo himself. …which leads me to say that yes, the technical achievements were actually good. The color palette used, despite being inconsistent (early morning scenes were too obviously blurry), but for the most part, they were a feast to the eyes. Production design was also commendable here. Though make up (especially that of the old woman) and the slow motion effects during war scenes were horribly bad. I don’t know if it’s Aguinaldo in general or probably just how Estregan played him, but he comes off as very blah in the movie. Put into mind that this is his movie, and this will make you grasp for straws with its long screentime. Probably it’s the director’s approach all along? Who knows? But he certainly lack the appeal of a lead character, and Andres Bonifacio was more delightful to watch despite not being in the screen for a long time. I was confused with the billing of the movie, though I guess they prioritized all the big stars in the poster for box office appeal. Cristine Reyes was a decoration to say the most (a beautiful one at that), and Christopher de Leon was memorable albeit appearing short here. Cesar Montano wasn’t in the last hour or so, but he brings a particular energy to his Bonifacio that I won’t be surprised if he gets awards notices for this one. Nora Aunor appeared only in the last 10 minutes of the film, so if you’re waiting for her, you can miss the first two hours and thirty minutes. I must say though that from the rest of the characters, Felix Roco ‘s Gregorio del Pilar and Sid Lucero were the two I enjoyed the most. In entirety, the movie was just okay. I don’t know if that was good or bad, but it was that. Just okay. The technical achievements were mostly good to horribly bad, and the screentime is difficult to sit through, then you’d have a blah lead in it. But there are saving grace such as Cesar Montano’s Bonifacio. So I guess it was uneven to okay. Last year, it was said that the Shake, Rattle, and Roll franchise will finally be put to an end. After all, it is on its thirteenth installment last year. However, with the surprising turn of events (okay, not really surprising), a 14th one was in the works, and is now part of this year’s Metro Manila Film Festival. This year though, only one director was behind the three movies, horror master Chito Rono. My review will be divided into the three different episodes. When a horror comics writer died, he left an inheritance to his two nephews and two nieces. He also left them each of his four original comics writings. With that, the writer also left a challenge to them. He left them five million each, but each time one dies, the dead person’s money will be separated into the remaining ones. With these horror comics characters going larger than life, and them being stuck in their uncle’s dead house, it ensues horror to these people. I feel this episode is the perfect throwback to the old Shake, Rattle, and Roll movies. For one, it stars the three leads of the three episodes of the first installment of this series. Second, I like how they connected it with an old horror concept: the power of comics. There’s really something that’s comfortable to watch here that makes the whole episode enjoyable. The ensemble was commendable too, with Janice de Belen, Herbert Bautista, and Arlene Muhlach all perfect choices in their roles. I like how it also ended which made it even scarier. When a simple military operation in the jungle turns into chaos as unknown entities start to meddle with them, it’s now up to platoon leader Martin Barrientos (Dennis Trillo) to act upon the remaining men in his team to survive. This one is based on current zombie craze such as The Walking Dead and the never ending zombie invasions. With that said, I like how director Rono presented this concept in a more interesting manner. It wasn’t simply zombies that appeared everywhere. There was also a nice dramatic play with the connection of the children to their fathers with the characters of Ella Cruz and Makisig Morales. The cinematography and visuals were pretty slick, and wasn’t difficult to the eyes. Sum it up with a memorable ending, and this is a good episode altogether. During December 21, a mall suddenly exploded and people inside it are fighting not only their way out, but fighting for their lives as well. The leader of the pack involves couple Hank (Vhong Mavarro) and pregnant Kate (Lovi Poe). In between, they’re with random mall goers who survived as well though a strange monster keeps on eating these people alive. I actually liked how this one played with two possible fears: the end of the world assumption and being trapped inside a wrecked shopping mall. Thus, I think that the movie started out good. However, the all out CGI monsters and the appearance and disappearance of all these other characters who weren’t even engaging to watch were a big NO. When we reach the end, it was all CGI now and lost all the potential it had in the beginning. I’d say Vhong Navarro was a charismatic lead, and he was definitely able to carry this episode in his shoulders.